Mother have been building a tall transmedia tale for Oasis: the forbidden love between Cactus Kid and his girl. The core narrative runs across a sequence of TV spots, and extends outwards in a sighting page on Flickr, an organisation of Mothers [wink wink] up in arms about it, a film trailer, a Myspace profile and a competition to find the kid on Google Maps. To bring the saga to a close, they are letting you decide what happens to the runaway couple and their newborn spikey baby by voting on the website. You realise this is an Oasis ad, right? Go and excercise your right to dictate the fate of the Cactus Kid - you can catch up on the story so far on the site. Nokia sponsored the Young Lions at Cannes as part of its effort to engage with the creative people, and position the NSeries as a tool for creative minds, similar to the way HP reached out with the Hype Gallery. I quite like the video above - especially the point about technology at the point of creativity that Bob makes - it's the topic of my chapter for Age of Conversation 2 - and the fact that no one really knows what the model is now, which makes things wide open and far more interesting [in my opinion] - as you long as you obey the cardinal rule: deliver value. The most viewed of the Young Lion entries on Youtube will be made into an MTV show. This presentation I found over on Asi's always excellent private selections, pulls together some things I've been talking / thinking about for ages, more eloquently and usefully than I ever could. It's great. The more I think about this, the more I'm convinced that we are in the happiness business - that it's our job to help people be happy, which seems like a good thing. I suspect that things that make people happy exist at equilibrium points - more of something [x] makes you happier, up to a certain point [y], after which the same thing will make you less happy. 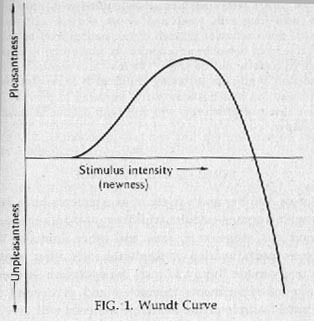 This has been demonstrated in arousal terms, leading to the development of the Wundt curve, which shows hedonic value garnered from increased arousal drops after a certain point. Same is true of choice, and complexity, curiousity, automony, and, I imagine, lots of other things. Which, I guess, bring us to the the platitude that too much of a good thing, ain't. My mate Ahra sent me this homage to Dr Seuss, discussing the pitfalls of using social media and that. It highlights that fact that almost any commercial approach via social media is considered, and rejected as, spam. You can't force people to look online - something else is just a click away: the transaction cost is so low that I'd rather move on than wait, and once I've moved on I won't come back unless there's a good reason. So the dudes at Yobi.tv - for verily this is a piece of 'viral' communication - changed the way they thought about social media and the end result was a pdf children's book about new marketing. We are all connected and the cost of propagating content is approaching zero - it's much, much easier to forward a link or post on a blog than it is to cut things out of the paper [but I do appreciate the fact that my Dad still does that]. So there is a distribution network primed and ready, thirsty for things to distribute, dissect and discuss. It's not about invading our spaces, finding out where we have run to and burrowing your way in, it's about giving us things to communicate with each other with, sending a friend a smile. And, often, as in this case, they way you get past the immediate rejection, what contributes to making the idea spreadable, is borrowed interest. I think this thinking is fundamentally flawed. It assumes that the function of advertising is to express a differentiating truth about the product or service, that makes you want to buy it - that advertising is salesmanship. Borrowed interest is an entirely sound strategy for attracting attention. The tea borrows interest from the chimps, the chocolate from the gorilla, the burger from the king, the insurance from the lizard or the caveman. Equally, by leveraging existing cultural artifacts, referencing and remixing symbolic structures, appending your products, you borrow interest to attract attention. It's not borrowed interest - it's creating interest in something that isn't itself interesting, by connecting something boring [most products, in most categories] to something else. Sure you can ladder up your product benefit to a higher order value proposition, but pretty much all your competitors could too. Clients tend to think their products are fascinating - if you spend your life thinking about something, it is going to take on a large significance in your life. Agencies tend to think what they do is interesting - but one of the first things you learn at an agency is that marketing clients only spend a fraction of their day thinking about advertising, although it is perhaps the most visible element of their roles. Calling people consumers tricks you into thinking they spend their whole lives buying stuff, or thinking about buying stuff. But they really aren't that interested. I had to make this Stuff On My Cat / Lolcat mash up - because ideas are new combinations and lolcats hold out an invitation to participation. When the original N-Gage launched I remember thinking: "That's a great idea, way ahead of its time, done incredibly badly". The original device was a bad portable gaming device - the buttons were in the wrong place, making it practically impossible to play Tony Hawk - and a bad phone - you had to hold it to its thin side to use it, which looked ridiculous and felt weird. It was like they had never tried to use it before the launched it to market. But now that phones have begun to evolve into micromachines and the N-Gage has evolved into a software platform that works across all the Nokia N Series smartphones, they might have a chance to eat into some of the latent gaming-on-the-go demand among existing Nokia users. And they've decided to make it easy for you to find out if you have any, which is a very good idea. [The biggest hurdle with games on your phone is that buying something for 5 [dollars or pounds] is a huge conceptual barrier - it's too high in relation to the amount you think you spend on your phone service. The App store is helping to change this perception - even the fact that it is called an App STORE helps, because it begins to educate people that mobile software is something you buy - but it's still there for many users. This is also why this area is the other half of what's interesting about mobile advertising, which we all know is the NEXT BIG THING, but if we attempt to transpose the interruptive display model from other media, like we did online, it will fail very badly very quickly - I do not want ads on my phone, unless it is in some way giving me value - and even then I'd rather pay not to have them there. So Nokia have decided to give one of the most popular game titles away - you can get FIFA 08 for your N-Series for free. And people love free things, because it makes you feel there's no potential for loss, and we are hugely loss averse, so that's good, but it will also drive trial among people who would never consider buying a game, but might like it if they did - boys like football, boys with N-Series phones have a higher than average propensity to like games on their phone. The video above is part of the promotion for the game giveaway - a communication paradigm I also really like: do something nice and then talk about it. Question: who do we make ads for? OK, technically the answer is clients, obviously, but, as Gossage was fond of saying, our first responsibility isn't to the product, it's to the audience. Let's then look at a difference of opinion in relation to the ad above [which is clearly awesome - but then the nature of aesthetics is by definition subjective, so what do I know?]. check out some of the most dismal ads on God's clean Earth. What is that bear shouting "BRING ON THE TRUMPETS" for, i dont get it, it does make me laugh for some reason tho....its quite funny! lol! this advert is mint! This is awesome. Don;t know why, don;t even care. officially the best advert ever made ever. In fact, since yesterday, when it was posted, over 50 people have commented and not one said anything negative. The Moth is a non-profit storytelling organisation that hosts regular storytelling events and competitions called StorySlams in New York. The main nights feature well known writers and the slams feature anyone who wants to compete by telling a story in 6 minutes. I went down to one this week, having listened to a bunch of the podcasts, and it was awesome. the characters in their best stories would often find themselves drawn to some bright light—of adventure, ambition, knowledge—but then find themselves burned or trapped, leaving them with some essential conflict to face before the story could reach its conclusion. It's a basic truth of storytelling - there needs to be conflict for there to be resolution: without that you've got a nonecdote at best. A while back I was going to write a post: the top ten reasons bloggers love lists, but a bunch of people have already done that. It's almost certainly something to do with the promise of structure and informational density and that. And that fact that it's very spreadable content. Julian has put together a Top 12 Historical Social Media Moments in Marketing and he has very kindly included the transmedia planning post I wrote [stealing heavily from Henry Jenkins] and its subsequent spread across the Internet and beyond at number 7. The Age of Conversation comes in at number 11 - the sequel to which comes out soon [the list is actually a chronology not a ranking].